💡 You need to list all the object files, the script does not have a feature to use all the .o files in a directory. I usually put the call to the Perl file into a batch file which I call from a post-build step (see “Executing Multiple Commands as Post-Build Steps in Eclipse“). 💡 I have not found a way to provide that information to the compiler in the source. UPDATE 24-Aug-2015: For all the C++ users: Daniel Beer has updated his article on http://www.dlbeer.co.nz/oss/avstack.html. This entry was posted in ARM, Building, CPU's, Embedded, gcc, Tips & Tricks and tagged arm gcc, Building, gnu gcc, Interrupts, open source projects, software, technology, Tips&Tricks by Erich Styger. Bookmark the permalink. This looks very useful. Have you compared the results from the GNU stack usage option method against the empirical approach? It matches very well. As said in the article, it counts recursion in a minimal way (I avoid recursion anyway) and does not cover assembly code (which I do not have much). The $call_cost is many times too pessimistic. MMU is a cool thing. But better if you know in advance, right? If you are doing this in Eclipse then you would replace Release with the path to your Release (or Debug directory). Also as an aside, I was running avstack.pl on Cygwin where it promptly died because of a carriage return that was being generated by objdump. Thanks for posting that tip with the find command! How we can pass the file ObjectList’s(generated by makefile.def) content to this script as input ? Thank you very much for this post, Erich! How do we know what ‘-fstack-usage’ includes or not in its output? is there some documentation about how these compiler options works? I was looking for that information but I haven´t found anything yet. Would you show your batch file where you call the perl script and pass the objects list? GCC simply knows the amount of local variables/stack in the compiler internal data structure, while allocating the local variables and temporary variables. To really know what is included or not you need to check the disassembly code, because it might differ from compiler to compiler. 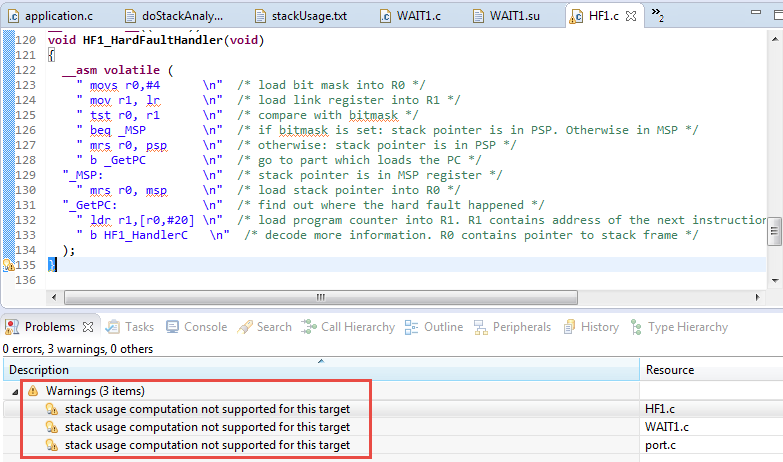 My finding is that it does not include the amount of stack needed which is added by the call instruction itself. This is not a big issue with ARM if the BX or BL instruction is used, as the return address is in the link register and not pushed on the stack. Simply add your own object files to it. 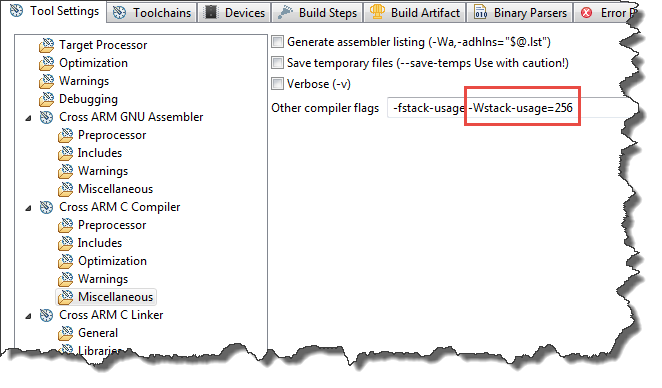 The avstack.pl doesn’t work correctly, when i compile my code using gcc. the result of Height will always 1,and the call path is also wrong. Is there something i have to edit? Thank you for you working. you have to call the avstack.pl with a list of object files, see the .bat file in https://github.com/ErichStyger/mcuoneclipse/tree/master/Examples/KDS/FRDM-K64F120M/FRDM-K64F_Demo. If you are not providing any object files, then the height indeed is only one (because you have not supplied all the needed information. I used the perl script with a batch file similar to yours. I used it for a FreeRTOS application. It seems to work fine on a individual function basis. However it does not tell me the stack usage of a function that calls other functions. So my result file contains only ‘root’ entries with an initial ‘>’. The entries for my tasks, that call some functions, are not having ‘child’ entries like in your example with foo and bar. So I can further examine by hand. However, it would be nice if the script will do the job for me. Do you have any hint what is not working in my case? I checked one more time and still get just every function listed on its own. But not with the accumulated numbers for each function call if there is another function call within. The script is the same for both of us. I also changed to Strawberry Perl. I assume it is more related to a compiler (optimization?) switch. I’m not using any special optimizations, so it must be something else? Maybe the compiler version? Are you using Kinetis Design Studio v3.2.0 too? This is handy, thanks Erich. For a Kinetis MCU running FreeRTOS we have used FRTOS1_uxTaskGetStackHighWaterMark. Good for self-test on critical systems. I have used a defined stack pattern in most projects, and for critical ones I have added a watchpoint to the end of the stack too to detect an overflow. The FreeRTOS uxTaskGetStackHighWatermark() is good too, but it is only set at context switch time, so it is possible to miss an overflow that way (see as well https://mcuoneclipse.com/2018/05/21/understanding-freertos-task-stack-usage-and-kernel-awarness-information/). The FreeRTOS stack overflow hook is something I have turned on for all my projects: it works very well, but here again there are some rare cases where an overflow cannot be detected.